Cyber Monday: the day the true professional shoppers hit the beat. Sure, some of the diehards will line up at oh dark thirty on Black Friday to crash the doors of a Target. But why battle for doorbuster items when you can get many of the same deals with the click of a mouse from the comfort of your home or office Monday morning? Yep, that’s what we thought too. So let’s take this to the next level — Cyber Monday deals before Cyber Monday. We pulled together five killer deals on some of the most fun tech items you’ll find this holiday season and we’re setting them loose before everybody else’s deals drop. Rather than shopping at work all day, just do your job on Monday instead! We’ve all wanted to pilot an X-Wing, so here’s your chance — and you don’t even have to join the Rebellion to do it. These Propel drones sport new Reverse Propulsion tech, fly at up to 35 miles per hour, and can pull all the aerial tricks from the movies. The companion app will run you through more than 30 training missions to hone your flying skills — and once you’re one with the Force, you can dogfight other Star Wars drones. 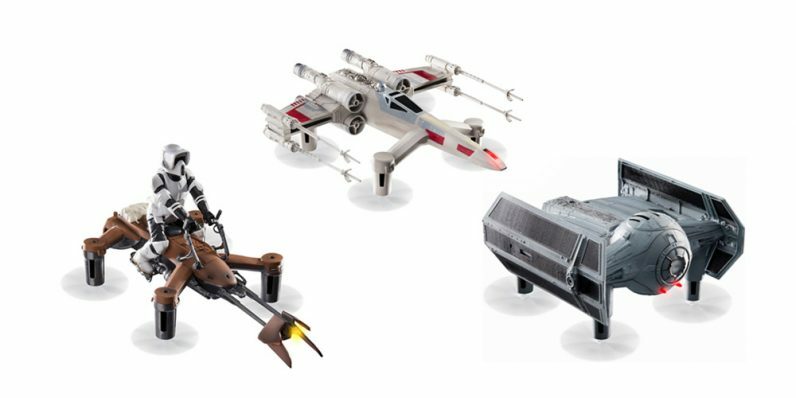 Choose from the X-Wing, Tie Fighter or Speeder Bike — and save $100 on each. This punchy little micro computer is portable power that fits in your pocket. The Ockel Sirius B comes with Windows 10, an Intel processor, 4GB of RAM and built-in WiFi and Bluetooth, which means it’s ready to handle any task your desktop or laptop can. With a full complement of ports, you can plug in all your peripherals and be up and running in minutes anywhere. And since it’s Cyber Monday, we’re taking close to $150 off the regular price. Let your music envelop you everywhere you go. The Cowin E8 headphones connect via Bluetooth and pump the tunes with crystal clear highs and deep bass. The rotating, ergonomic ear cups are not only designed for comfort, but also employ premium-grade Active Noise Cancellation Technology, extinguishing outside world noise so you can focus on your audio. Normally $199.99, take advantage of the holiday price break and save $90. If you haven’t joined the robot vac revolution yet, now’s the time. Set the Tesvor Robot Vacuum loose in your home, input your cleaning schedule with the smart app, then sit back and enjoy dust and debris-free floors. The Tesvor is equipped with superior gyroscope navigation technology so it memorizes paths through your home quickly and avoids getting stuck or those perilous tumbles down stairs. It’s crazy quiet and you can even control in via voice commands through Alexa or Google Home. It pans, it tilts, it’s the unblinking eye that keeps your home or office safe 24/7/365, even in the dark. Set up your Oco Motion HD security cam and it alerts you to disruptions, feeds HD-quality video to your phone or saves it to a Micro SD card or pushes it to the Cloud. It’s also packed with self-learning motion and sound detection, so if your pet or normal house noises trigger false notifications, the Oco adjusts and doesn’t repeat past mistakes. You can save over $60 with this limited time Cyber Monday offer.